For other uses, see Tabaré. This name uses Spanish naming customs: the first or paternal family name is Vázquez and the second or maternal family name is Rosas. Tabaré Ramón Vázquez Rosas (Spanish pronunciation: [taβaˈɾe raˈmom ˈbaskes ˈrosas]; born 17 January 1940) is a Uruguayan politician serving as the 41st and current President of Uruguay since 2015. He previously served as President from 2005 to 2010 as the 39th officeholder. A physician (oncologist), he is a member of the leftist Broad Front coalition. Vázquez was first elected President on 31 October 2004, took office on 1 March 2005, and relinquished the office on 1 March 2010. José Mujica was then elected, serving from 2010 to 2015. Vázquez was re-elected to take office for the second time in 2015. Born in the Montevideo neighbourhood of La Teja, Tabaré Vázquez studied medicine at the Universidad de la República Medical School, graduating as an oncology specialist in 1972. In 1976, he received a grant from the French government, allowing him to obtain additional training at the Gustave Roussy Institute in Paris. From 1990 to 1995, Vázquez was the Frente Amplio coalition's first Mayor of Montevideo. In 1994, he made an unsuccessful run for president as the Frente Amplio candidate, receiving 30.6% of the vote. In 1996, he was elected leader of the Frente Amplio, replacing the historic leader of the left-wing coalition, Liber Seregni. He ran again in 1999, receiving 45.9 percent of the vote in the runoff election, losing to Jorge Batlle. Vázquez and his wife, First Lady María Auxiliadora Delgado. Vázquez is married to María Auxiliadora Delgado and has three biological children with her (Ignacio, Álvaro and Javier) and an adopted son (Fabián). In the 2004 elections, he won 50.45% of the valid votes, with 1,124,761 votes on the first ballot--enough to win the presidency in a single round. To date, he is the only president since the institution of a two-round system in 1999 to win without the need for a runoff. He took office in early 2005. He became the first Uruguayan president from a left-wing party, and thus the first one who did not belong to the traditional right-wing conservative parties, the National (Blanco) and Colorado parties. With his own Broad Front holding a majority in Parliament, Vázquez was thought to have few obstacles to start with. He also had the support of the President of Brazil, Luiz Inácio Lula da Silva, likewise a centre-left democratic socialist. Vázquez is a notable football fan. During his ten-year stint (1979–1989) as president of the Club Progreso team, it won the professional national championship (for first and only time) in 1989. Among the most complex issues that have dominated his administration is an ongoing conflict with Argentina over potential contamination from pulp mills being built on the Uruguayan side of the Uruguay River. Vazquez has tried to create new commercial and cultural links outside the region. Vazquez was the first Uruguayan President to visit New Zealand and South Korea, and has established contacts with other countries in Southeast Asia. While he maintained cordial relations with the United States, hosting U.S. President George W. Bush, Vázquez did not sign Bush's failed Free Trade Area of the Americas. In June 2008 President Vázquez visited Cuba. While in Cuba, Vázquez and the Presidential party engaged in a number of high-profile events, including a summit with President Raúl Castro. This visit attracted a measure of censure from the Uruguayan Opposition, from Pedro Bordaberry and others, who were critical of Vázquez for having chosen to be in Cuba during a commemoration – which Vázquez himself initiated – for the victims of the 1973–1985 dictatorship; Bordaberry's father, Juan María Bordaberry, established the dictatorship with a 1973 decree dissolving Congress. In 2007 the loading of Iranian arms onto a Uruguayan Navy vessel visiting Venezuela, in contravention of a UN-sponsored arms embargo, provoked international comment. Internal controversy regarding this event was centred on protests to Vázquez's Government from the Uruguayan opposition National Party. In February 2010 the Vázquez Government was cooperating with an investigation to explain how two Northrop F-5E jet engines valued at many millions of US dollars had surfaced in Uruguay (See: Royal Malaysian Air Force#Engines diverted to Uruguay ). In June 2009 President Vázquez, who had been courting diplomatically the Bolivian President Evo Morales, announced his support for the delisting of coca leaves from the category of a 'dangerous drug'. President Vázquez began his tenure with a 77% approval rating; but according to an Equipos/MORI opinion poll his approval had fallen to 44% by April 2007, a level below the electoral support he received in the 2004 elections. His approval later recovered, however, reaching 80% by his last term in office. While his decision not to sign the failed Free Trade Area of the Americas treaty in 2006 alienated conservative voters, other moves by his administration concerning economic policy have met with resistance from trade unions and the left. Furthermore, many believe[who?] that Vázquez's opposition to legalising abortion and threats to veto any pro-choice legislation passed by the government – a position that stands in contrast with the opinions of the majority of his governing coalition – have made a modest dent in his public support. (Against this it may also be noted that one of the constituent parties of the ruling Frente Amplio coalition – the cohesion of which Vázquez is pledged to maintain – is the Christian Democratic Party of Uruguay, which opposes the measure.) In October 2006, President Vázquez was still personally more popular than his government with a 62% approval rating. However, a considerable drop in the government's popularity was registered by an Equipos/MORI poll in late April 2007, showing that 44% of Uruguayans approved of his administration. A new poll by Factum showed a 57% approval by June 2008, however, indicating a significant recovery from a year earlier. 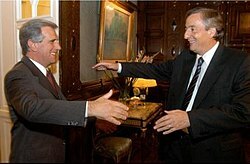 In January 2008, two members of the ruling coalition, former Senator José Korzeniak and Foreign Secretary Reinaldo Gargano, made proposals to reform the Constitution of Uruguay, focusing on the possibility of the immediate reëlection of the President (forbidden under the present constitution). The central tenet of the re-election clause is based on Vázquez continuing popularity and in order to prevent a divisive succession battle within the Frente Amplio. A reform of the constitution is quite unlikely, however, as all of the opposition parties, as well as some members of the ruling coalition, have expressed their opposition to this idea. Vázquez himself ruled out that he would try to be reëlected in a public address he made in June 2007. A perceived strength of Vázquez is his ability to hold together in the Frente Amplio ruling coalition figures of greatly differing outlook. After the Mujica-Astori couple were elected in November 2009 as President and Vice President respectively, Vázquez was offered to resume the presidency of the Frente Amplio but he declined. Vázquez went on to be the Frente Amplio candidate for Presidency in 2014. On December 4, 2008, Vázquez resigned his leadership posts at the Socialist Party due to controversy over his opposition to abortion rights. Vázquez left office in 2010, at the end of his 5-year presidential term, with an 80% approval rating, a record in Uruguay. He formally announced his candidacy for the 2014 election in November 2013. Renominated by the Broad Front for the Presidency with running mate Raúl Fernando Sendic on 1 June, he came up just a few thousand votes short of winning the presidency outright in the 26 October election. He was returned to office in the 30 November runoff, defeating right-wing candidate Luis Alberto Lacalle Pou of the National Party by 53% to 41% in the second round. Vázquez was awarded the World Health Organization Director General's Award in 2006 in recognition of his leadership on tobacco control in Uruguay, which has implemented some of the most stringent tobacco control measures in the world. ^ "Uruguay curbs smoking in public". BBC News. March 1, 2006. Retrieved May 24, 2010. ^ "Tabaré Vázquez ve inviable al ALCA; Fox lo refuta". El Universal. 27 April 2006. ^ SEPREDI, Departamento Web - Presidencia de la Republica Oriental del Uruguay. "Scenes from President Vázquez's June 2008 visit to Cuba". Archived from the original on 2008-07-09. ^ Pedro Bordaberry (26 June 2008). "Más, nunca". Esta Boca es Mía. ^ "'Uruguay caught buying Iranian arms'". The Washingtion Times. ^ "El enigma de los motores de F-5 robados". El País. 3 February 2010. ^ "Uruguayan ports will give Bolivian trade access to the sea". Mercopress. 15 July 2009. ^ a b "Vázquez tiene un 44% de aprobación, según encuesta de Equipos Mori". El Espectador. 16 May 2007. ^ a b "Tabaré Vázquez cierra su mandato con récord histórico de apoyo popular: 80%". La Red 21. 22 December 2009. ^ "Vázquez con 57% de aprobación". La República. 3 July 2008. ^ "The Broad Front's candidates and platform". El Observador (in Spanish). 25 November 2013. ^ "Victory of Vázquez in the Uruguayan primaries". EL PAIS (in Spanish). 2 June 2014. Archived from the original on 2 June 2014. ^ "Uruguayan ruling party's Vazquez wins presidential election". Buenos Aires Herald. 30 November 2014. ^ "Vázquez' future cabinet". El Espectador. Archived from the original on 13 December 2014. Retrieved 3 December 2014. ^ "ECUADOR CONDECORA AL EX PRESIDENTE TABARÉ VÁSQUEZ" (in Spanish). Ministerio de Relaciones Exteriores, Comercio e Integración - Ecuador. 7 September 2010. ^ "Award Winners named for World No Tobacco Day in the Americas". PAHO. 30 May 2006. Wikimedia Commons has media related to Tabaré Vázquez. This page was last edited on 2 April 2019, at 17:21 (UTC).